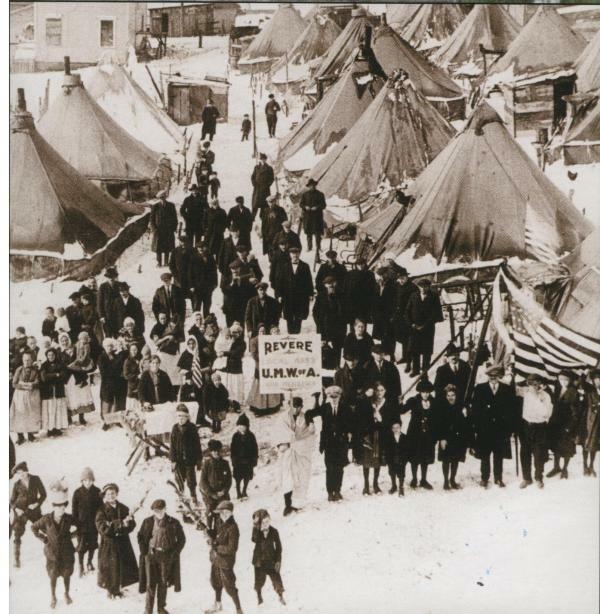 Tent colony of evicted strikers and their families, Fayette County, PA, 1922. Flip to Unidentified corpses at Darr Mine Explosion, Westmoreland County, PA, December 1907.
Credit: The Coal & Coke Heritage Center, Penn State University Fayette Campus, Uniontown, PA. When its miners joined the national coal strike of 1922, the W. J. Rainey Coal Company expelled them and their families from the company-owned patch houses near the Revere Mine. To house them, the United Mine Workers of America set up this tent city on a farm outside of the coal company property near Revere, PA. Some miners and their families lived here through the cold winter of 1922-1923.